Botox is a simple non-surgical treatment injected into facial muscles in order to improve the look of wrinkle and frown lines. Once the Botox treatment has been injected it will produce a smoother complexion. Botox has been used for over ten years and is becoming the most chosen non-surgical treatment to reverse the signs of aging. Botox injections are very safe and require no downtime for recovery. Cosmetic fillers are substances injected through small needles into the skin to smooth depressions caused by wrinkles, folds and scars. Fillers can also be used to augment existing features such as eyebrows, lips and sculpting the nose. Who is best suited for Botox? Botox can be used on any man between the ages of 18 to 65. When will I see the results from Botox injections and how long do they last? The results from a Botox injection will be visible within a few days as you will see marked improvements in your frown lines. 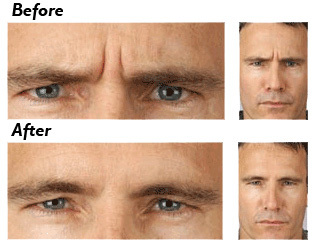 The improvements to your frown lines will continue for approximately 30 days and last up to 4 months. Botox works by temporarily blocking nerve impulses from travelling to the injected muscles. As a result this reduces the muscle activity that causes moderate to severe lines to form between the brows and on the forehead. When you squint, frown or concentrate the muscles between your brows contract, this will cause your skin to furrow and fold. After years of frequent contraction, those wrinkles can linger even after the muscles are at rest. What are the Medical uses for Botox? The discomfort felt while undergoing Botox treatments is usually minimal and brief. If requested the area being treated can be numbed with a cold pack or anesthetic cream. Cosmetic fillers are an effective and safe way to replace the hydrolic acid your skin losses with age. This procedure will bring back the skins volume and flattens out facial wrinkles and folds. The results from cosmetic fillers are immediate. Depending on your treatment quantity, results may last for up to one year. What are the benefits of cosmetic fillers over other similar treatments? There have been a variety of filler agents successfully developed, and all of them have a unique aesthetic result. Man Calgary uses Restylane, Juvederm and Teosyal, and chooses the best filler agents to meet each patient’s needs.